She saves his life, and he’s determined to repay that debt by traveling with her, though he has second thoughts when he learns she’s planning on robbing an infamous pirate. Really though, this shouldn’t surprise him, since she was robbing his boss when they met. 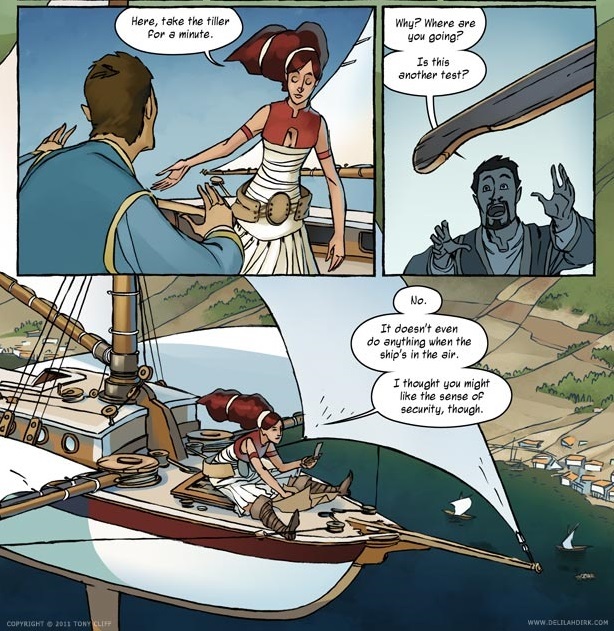 There’s a lot of thievery and sword-fighting wherever Delilah goes. And explosions. Let’s not forget the explosions. Selim is the audience surrogate character. He’s not a fighter or globetrotter like Delilah. His main skill is making a killer cup of tea. The reader gets to learn more about Delilah as he does, and he’s our viewpoint character for most of Delilah’s adventures. But what sets him apart from this type of bland everyman character in other stories is his depth and sheer likability. He’s unfailingly polite and has a strong sense of integrity—which is what drives him to travel with Delilah at the same time it causes him doubts that he’s doing the right thing. Delilah is often careless about the damage her exploits cause. Selim worries about that kind of thing, and he’s all too aware that he doesn’t have Delilah’s skills and isn’t as suited to her lifestyle. But he gets swept up in the moment every now and again, and there’s a part of him that craves the adventure. There’s a lot to like in this book. It has a good sense of humor which comes from witty dialogue, great character expressions, and visual gags. Nineteenth century Ottoman Empire isn’t a setting you see often in comics—or in any media—and the art makes it a lovely place to visit. But the best part of the book is Delilah and Selim’s odd-couple relationship. 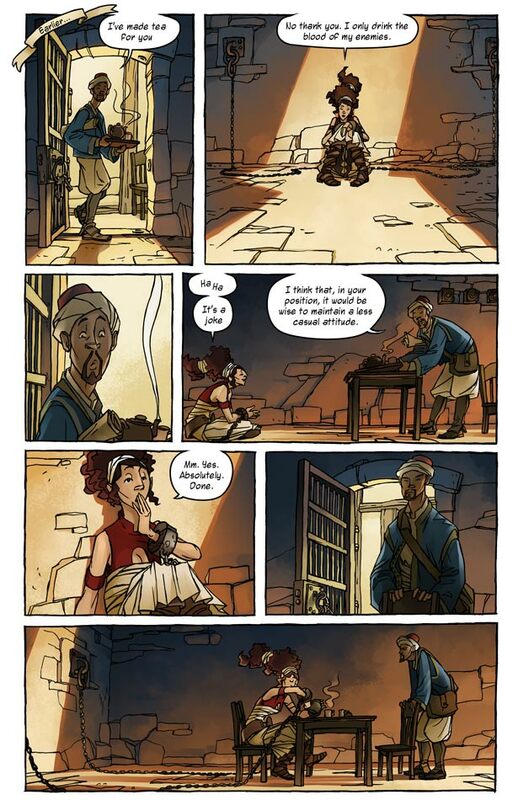 I’m a big fan of character development, and watching Selim go from Delilah’s hapless sidekick along for the ride to an active partner making an equal contribution to their adventures is my favorite part. Well, that and the swordfights. And the flying boat. 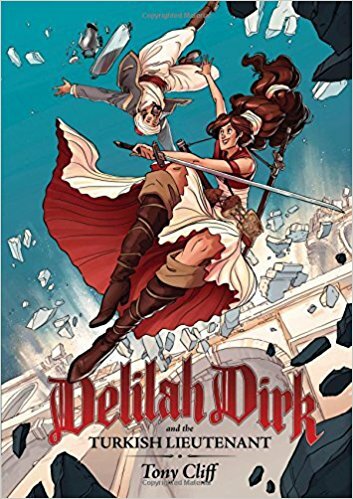 If you’re a fan of the swashbuckler or action/adventure genres, you owe it to yourself to read Delilah Dirk and the Turkish Lieutenant. You can preview the first two chapters online and then buy the book once you’re hooked. And there’s a sequel, so the fun doesn’t stop there. So brew yourself a hot cup of tea and settle in for a page-turning adventure. 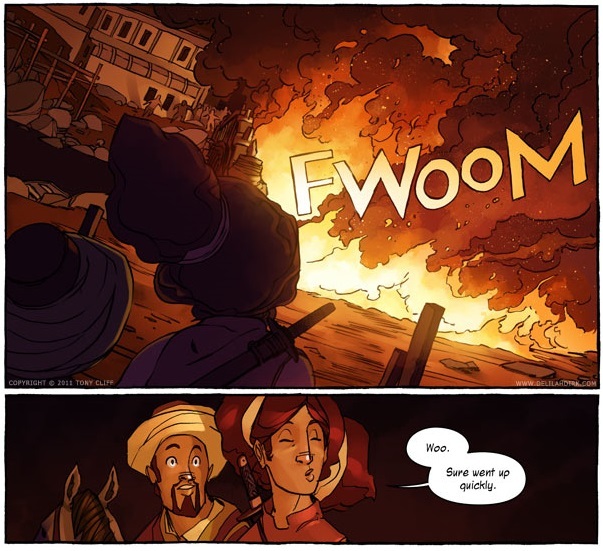 Anybody else read Delilah Dirk? Who’s your favorite fictional swordswoman? Let me know in the comments! Good on you for avoiding the easy Turkish delight review pun. I’ll have to check this one out!